Having this as its motto or vow is situated the elegant and magnificent building of Anandashram Sanstha in Appa Balwant Chowk, the most densely populated and frequented area of the Pune city. This is the first institute in Pune established for the avowed cause of Sanskrit, which will soon complete 130 years on 2017. It is the creation of one single person, the renowned and successful High Court Advocate Mr. Mahadevarao Chimanaji Apte (1845-1894 A.D) who founded. His nephew Mr. Hari Narayan Apte, the famous social reformer and historical and social novelist, thinker, journalist, and Sanskritist, etc. who was very proficient in languages, especially in Sanskrit, was appointed for this Trust. Mahadevarao’s uniqueness lies in donating all his property to the trust he formed having following reputed persons at that time as trustee : 1) Rao Bahadur Vasudeo Bapuji Kanitkar 2) Gangaram Balsoba Rele and 3) Mr. Shriram Hari Sathe. This is the First trust in Maharashtra which is formed by an individual other than Parsis to benefit students and elevation of Sanskrit. At the end of his life Mahadevarao decided to formally and ritually renounce but only after fulfilling his dream of Anandashram with the Shrisachchidananda temple therein. He tried for and got the permission from the British Government, well in advance for his Samadhi below the temple and then was initiated in atur sannyas. 1. To publish books in Sanskrit on all subjects of Hindu religion as well as Indian culture and to collect, store and preserve manuscripts in Sanskrit making them available to future scholars and researchers. 2. To build a temple of Shrisachchidananda Shivashankara on the second floor of the library building. 3. Provide lodging and boarding to the students coming to Pune for the Maharashtra. They can study any discipline for subsistence but should invariably possess very good character. The learned sadhus and sanyasis should also be allowed to stay there for three days. The executive running the institute should also be well- educated and of extremely good character. 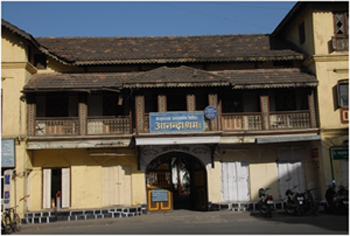 He assigned the responsibility of the construction of the building together with the temple on Rao Bahadur Dadasaheb Kanitkar, who was the Municipal Corporation, Pune at that time. 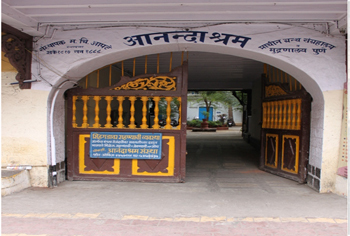 Having this as its motto or vow is situated the elegant and magnificent building of Anandashram Sanstha in Appa Balwant Chowk, the most densely populated and frequented area of the Pune city. This is the first institute in Pune established for the avowed cause of Sanskrit, which will soon complete 130 years on 2017.It is the creation of one single person, the renowned and successful High Court Advocate Mr. Mahadevarao Chimanaji Apte ( 1845-1894 A.D) who founded.